Many people have e-mailed me regarding confusion with Interweaves chart for the cables of the Laporte Tote. The confusion is typically because most often charts start with the right side of your knitting following the chart from the lower right hand corner reading the first row right to left. The chart for the top cable band of the Laporte Tote is knit starting with a WRONG SIDE row and therefore the chart in the magazine starts from the lower LEFT hand corner reading that first row from left to right. 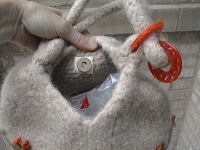 A person contacted me on Ravelry with an error in the Katie Bag pattern in the magazine. It’s on the directions for the Cable Pattern for the side of the bag (that eventually turns into the handles). LORIN The interior pocket for Lorin is worked with a single strand of Lamb's Pride Bulky. Also note there is no exterior pocket on Lorin. SHE-KNITS KNITTING TECH text and pictorial tutorials below cover techniques used within She-Knits patterns in case the lovely She-Knits knitters need more detailed information. Most She-Knits patterns that are labeled beginner or advanced beginner have this information within the pattern itself however embroidery stitches used are detailed below. Intermediate She-Knits patterns do not go in to as much detail, however details of techniques in those patterns may also be found here. Please contact She-Knits if you have any questions. 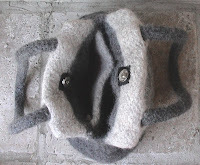 This is often used to finish the top of the bag however many she-Knits patterns use applied i-cord cast off with decreases (which are noted in each individual pattern). With backwards loop cast on cast 2 sts. on left hand needle. *K1, sl 1, k1 (this stitch will be the first stitch from the body of the bag) With the left needle, pass the slipped stitch over the last knit stitch. Slip those sts. back onto the left hand needle*. Repeat between *’s until all top of bag sts have been knitted. Cast off the remaining 2 sts. leaving a long tail. *Loop working yarn and place it on -needle backward so that it doesn’t unwind. Repeat from *. Bring the thread up at the top of the line and hold it down with the left thumb. Insert the needle where it last emerged and bring the point out a short distance away. Pull the thread through, keeping the working thread under the needle point. Bring the thread out at the required position, hold the thread down where it emerges with the left thumb and encircle the thread twice with the needle (see A). Still holding the thread firmly with your thumb, twist the needle back to the starting point and insert it close to where the thread first emerged (not in the exact place or it will simply pull back through). Pull the needle through to the back, leaving a small knot on the surface, as shown, or pass on to the position of the next stitch as at B. Work in the same way as Chain Stitch (A), but fasten each loop at the center with a small stitch (B). This stitch may be worked singly or in groups to form flower petals. Working from left to right, bring the needle up at A, down at B, up at C, down at D. Continue this pattern to create raised effect. When working I-cord, work is not turned. Instead of turning the work around to work back on the WS, slide all sts to the other end of the needle, switch the needle back to your left hand, bring the yarn around the back of the work, and start knitting the sts again. After the first 2 sts, give the yarn a sharp tug. Repeat this row to form I-cord. After a fewrows, the work will begin to form a tube. Intarsia is large blocks of single colors that make a design. Separate small wound balls of yarn or bobbins of yarn are used for each area of a color across the row. begin your color work chart. yarn *under* OLD. This is much easier to see on the purl side of your knitting. If there are small gaps when you are done with your knitting felting will take care of much of this. If there are larger gaps it is best to use your yarns ends to neatly sew together any larger gaps before you felt your bag. Ribbon mounting magnetic snap (double click on written tutorial or images to enlarge) The tutorial shows how to mount the snap in grosgrain ribbon. The pictures of examples of the mounted snaps sewn in to the bags. Please contact me if you have any questions.